Hunter, Denise. 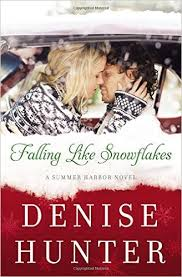 Falling Like Snowflakes: A Summer Harbor Novel. Nashville, TN: Thomas Nelson. 2015. Oh the possibilities of a new series from author, Denise Hunter. Initially drawn to the book by the cover and title, I also was pulled into the story as it progressed. Though perhaps a bit predictable in parts, the bits and pieces involved kept my interest til the end. Full of family situations, possible real-life complications and even a realistic finish, Falling Like Snowflakes was certainly a good read. Not usually a huge fan of contemporary genre, this book may have affected that theory more than a mere trace. With many possible characters for future stories within the Summer Harbor series, I will definitely continue with this author and her future books. This entry was posted in Christian Books and tagged Christian, Christian Author, Christian Book Review, Christian Contemporary, Christian Fiction, Christian Romance, Denise Hunter, Falling Like Snowflakes, Inspirational, Summer Harbor Series by Savurbks. Bookmark the permalink. I’ve every intention of continuing with this series, too! There were good setups for the other characters’ stories, without the author going off on too-long-tangents to set the stage for the next book(s) in the series, which happens sometimes in series novels. I so agree…there was just enough for more!